I am a thirty-something from MA seeking some information in order to better understand and better honor the service of my grandfather and his brother (KIA) in WWII. My grandfather and his younger brother fought in WW2. My Great Uncle, SSgt Albert J. Hands, was killed in combat. I am trying to find out what medals, insignia, campaign ribbons, etc, he would have received. He was in the U.S. Army Air Forces, 9th Air Force, 451st Bomber Squadron, 322nd Bomber Group, Medium. He enlisted on 11-5-41 and he enlisted at Camp Upton Yaphank NY. At the time of his death he was a Radio/waist-gunner. His final airfield location was Beauvais-Tille, France (A-61). His last mission was the cross-roads at Stadtkyll, Germany on 1 Jan. 45 where he was shot down around 2:45P by 88mm flak. The ship he was in for his final mission was: B-26G-15-MA Marauder Serial #44-67813/SS-P.
His serial number was: 32179521. He was awarded the Air Medal with 6 Oak Leaf Clusters and the Purple Heart. Beyond that, I am not sure what he would have had in terms of medals, campaign ribbons, decorations, insignia, and was wondering if anyone could help me figure that out or point me to someone who could? Thank you so much for your time and support! I am also wondering under what topic/s it might be best to post this under? I will also provide you a link to the NARA application for records information. Being a family member you are entitled to replacement medals for your relative. I have researched and applied for hundreds of records for members and non members seeking information about their relatives. I have had about a 97% success ratio, (Some of the records lost in the 1970's fire) but there are other ways to get the records and information.. I also will include my email address so that we can better talk and communicate about this process. It is long and sometimes confusing but with the right people to guide you it won't be difficult. The biggest thing in this process is the wait time. It could take up to several months to get a reply back from NARA since these are GVT employee's. (No disrespect intended, since I myself work for the Government) in a US Army museum.. Send me an email to: smitfamclan@aol.com. Make sure you put Veterans Research in the header so if it goes to spam I can retrieve it.. I used to live in Salem, NH so were neighbors.. CIVILIAN OCCUPATION 627 Semiskilled occupations in fabrication of textile products, n.e.c. We will keep your request here for a few days under introduction so it can get the maximum exposure to readers, then after some time I will move this to the RESEARCH sub forum.. I cannot add anything more for you than Smitty and Scott G already have but wanted to welcome you to the AMF. Where in MA are you? I live in Rehoboth MA but grew up in Attleboro MA. The "Jewelry City". Home to LG Balfour, Jostens, Amcraft, VH Blackinton etc. Luke -- Welcome to the Forum and good luck on your research. I live in Brewster on the Cape. No Reply back yet from Luke..
Wonder if he found what he was looking for.. There appears to be a lot of information on line about one of his relatives.. Photos, missing air crew report ect.. Welcome to the forum! Echoing what has been said, Smitty has provided the best path for pulling your Great Uncle's record. It can be a long and daunting process, and unfortunately, they may not have a complete file for Albert at the Archives (fire in 1973 destroyed a large portion of Army records). To add another option, there are private researchers that can pull these files for a fee. At times they are more thorough, and explore other options to find records. Additionally, wait time should be much less than submitting the request through the archives. We can only assume what other awards he would have would have earned in addition to the Purple Heart and Air Medal. Were I to take a stab, I would definitely say the EAME Campaign Medal (European-African-Middle Eastern) and American Defense Medal (pre-December 7th 1941 enlistment). Also, possible he earned the Army Good Conduct Medal, as at the time 1 year service while at war (assuming he was of good character), would have earned him the medal. As for insignia, most definitely the 9th Army Air Force patch. I assume, as a Radio Operator, he would have worn standard Air Crew Wings. Based on years of service (41-45), prior to being KIA, he would have worn 1 service stripe, for 3 years total service. He likely would have worn overseas bars, one each, for 6 months overseas service, but without knowing how long he was overseas, no way of saying how many he would heave earned prior to being KIA. Collar insignia would have been US on the wearers right collar, and Air Corps on the wearers left collar. And of course, he would have worn SSgt rank on both sleeves. Commendable thing you are doing, by the way. 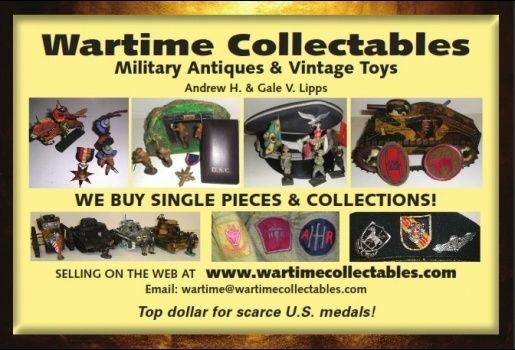 Researching my great uncle, who was also KIA while serving in the AAF during WWII, is what sparked my interest in collecting militaria and learning about the individual history of these men and women. Good luck in your research! You do a great service in helping people find their relatives military past. Hopefully this individual will post a follow up and thank you. Thanks again for the compliment..